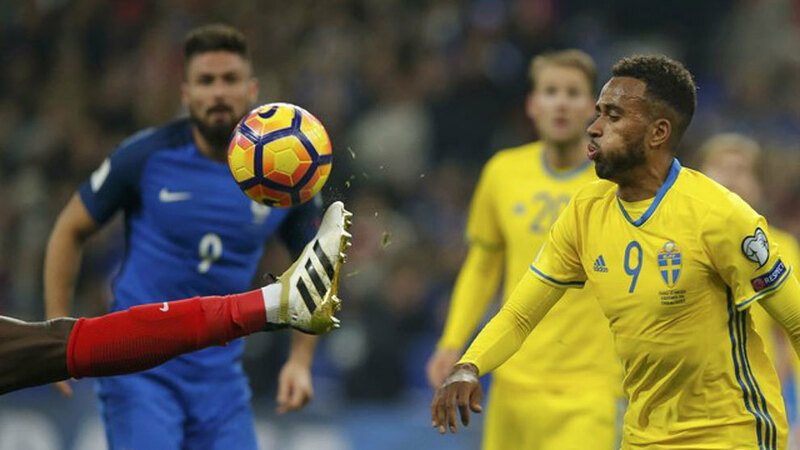 France midfielder Dimitri Payet scored the winner after setting up the equaliser in a 2-1 victory over Sweden in a top-of-the-table clash as they opened up a three-point lead in World Cup qualifying Group A at the Stade de France on Friday. The visitors went ahead in the 54th minute through Emil Forsberg before Paul Pogba and Payet hit back with goals in the 58th and 65th minutes respectively to put France on 10 points ahead of Sweden after four games. The Netherlands, who travel to Luxembourg on Sunday, are in third place on four points. A minute’s silence was held before kickoff to mark the first anniversary of the Paris attacks that killed 130 people on Friday Nov. 13 when bars, restaurants and the stadium where Les Bleus were playing a friendly against Germany were targeted. 2 – France: Hugo Loris; Sidibé, Varane, Koscielny, Evra: Matuidi, Pogba; Sissoko, Griezmann (N’Golo Kanté, min.88), Payet; Giroud. 1 – Sweden: Olsen; Krafth, Lindelöf, Granqvist, Augustinsson; Ekdal (Hiljemark, min.66), Johansson, Durmaz (Jansson, min.87), Forsberg; Guidetti (Thelin, min.73), Toivonen. Goals: 0-1, m.54: Forsberg. 1-1, m.58: Pogba. 2-1: m.65: Payet. Referee: Mirolad Mazic (Serbia). Cards: Pogba and Lloris por Francia. Krafth and Hiljemark for Sweden. Stadium: Parc des Princes, Saint Denis. Paris, France.